The focus of Sura al-Hujurat is to teach believers excellent conduct. In this course, Shaykh Faraz course looks at how the sura teaches believers the proper attitude and conduct towards Allah, and towards His Messenger, Allah bless him and give him peace. Next, we learn how conduct should be toward the corrupt, lest it lead to personal harm, and then there is an extensive look at how believers should behave towards other believers in their presence and in their absence. This course is essential guidance to make these relationships thrive in one’s life. The keys of excellence in relations are found in Sura al-Hujurat. It calls to the believers to adopt these standards, appealing to the God-given faith that we have as the motive for making us do so. 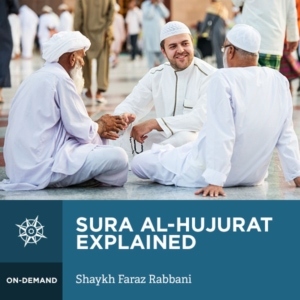 Shaykh Faraz Rabbani clearly presents the themes of this sura drawing on the wisdom of great scholars such as Imam Fakhr al-Din al-Razi, and Shaykh Ahmad ibn Ajiba. This course discusses what proper conduct before Allah is; the rank and wisdom of the Messenger of Allah, Allah bless him and give him peace; how believers should be towards him; and the immense blessings of faith, guidance, and obedience. We learn to confirm what we hear before judging and acting, and how to be just and merciful to believers should they have a dispute amongst themselves. Mockery, name-calling, spying, and backbiting are also addressed due to the extremely detrimental effect they have to relations. The course concludes with looking at what is a real virtue, and how those of virtue should deal with others to manifest it. We see that Allah constantly calls to obedience, yet He also reminds us of His mercy, reminding us to have proper conduct towards Him.